^ Hauge, Michelle V.; Stevenson, Mark D.; Rossmo, D. Kim; Le Comber, Steven (3 March 2016). 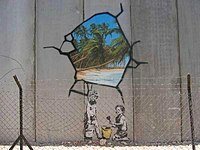 “Tagging Banksy: using geographic profiling to investigate a modern art mystery”. Journal of Spatial Science. doi:10.1080/14498596.2016.1138246. http://www.tandfonline.com/doi/abs/10.1080/14498596.2016.1138246?journalCode=tjss20.